Caution: Don't Let This Google Oversight Make You a Victim Of Spam! Now you might be wondering what the hell am I talking about? I started getting these spam emails from a guy I didn’t know. A quick check told me that this guy had a Google plus account and that he must be in one of my circles. It turns out that Google recently made some changes that make it easy for people who you are connected to on Google plus to send you emails directly to your gmail account without even knowing your email address. Yeah, let’s just say that’s what I thought, only I had a few stronger words. But fear not, the fix is a simple one and I will show you how to do it right now. You might be thinking to yourself, mhhh. No wonder I seem to be getting a lot of spam to my gmail account recently – all from total strangers, spammers. Yikes! 1. 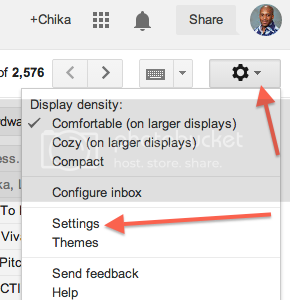 Click HEREto go to your gmail settings, or if it doesn’t work then go to the top right hand side of your email pane and click on the little down arrow beside the cog and go to your settings. O On the General tab. Scroll down to the 8th item that says Email via Google +: and where it says “Who can email you via your Google + profile”: Anyone on Google + may be selected, in which case choose the drop down section and select No one. 3. Scroll all the way down to the bottom, and in the middle Click on Save changes. Your done and those pesky Google + spammers won’t be able to send you any more spam. So if you’ve been receiving unsolicited emails from Google + users and are scratching your head thinking – how is this happening? Please feel free to share and take action to prevent this. P.S Spamming people whether via email or on here at Ibotoolbox is despicable! P.P.S When you spam, you’re really saying is that I’m a spray and pray marketer and I’ll just throw so much spaghetti on the ceiling and hope some of it sticks.